This week, the Switch UI is detailed, along with more launch titles. The mustachioed plumber will be running onto Android phones in just over a month. While no exact release date was given, it was confirmed that Super Mario Run for Android would charge the same entry fee as it did on iPhone, being ten dollars. Of course, players will be able to download it for free and play three different levels in the World Tour mode, and the entirety of the Toad Rally mode. Super Mario Run was well worth a buy when it was released on iPhone, it should be no different when it comes out for Android. 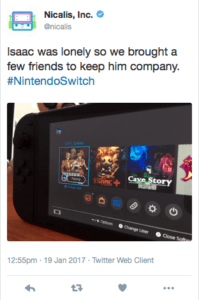 Indie publisher Nicalis has released an image showing The Binding of Isaac running on Switch, along with its confirmed release date. It will launch alongside the Switch on March 3rd. Also, in a deleted tweet, Nicalis showed a little more of the Switch’s UI. It seems to be a small divergence from the Wii, Wii U, and 3DS’ grid-like UI, moving closer to that of the Xbox One’s and PS4’s by using tile icons. This deleted tweet also revealed that 1001 Spikes and Cave Story would be coming to Switch, but no word was given as to their release dates. Reportedly, the Switch will lack streaming services such as Netflix and Hulu at launch. But Nintendo is considering implementing them in the future. Considering that most movie streaming apps are available on hundreds of different devices, this shouldn’t be a deal breaker for anyone. But, it could hurt Nintendo’s reputation due to a lot of said devices being rival consoles. The new Zelda title can be played in many different languages, but these audio clips can only be accompanied by subtitles of the same language. Basically, you can’t play the game with the Japanese voice acting and English subtitles, or any other combination. This will prove disappointing for those who prefer the sound of a different language, but don’t speak it themselves. Although, we should just be happy that this iteration actually has voice acting, to begin with. A multiplayer mode has been revealed for Yooka-Laylee, but it’s probably not what you think. This isn’t a co-op mode where you and a friend explore the world together, but a mini game mode where you compete for highscores and the like. It looks promising, to be sure. Yooka-Laylee can really only get better from this. It seems to be a fun distraction that was added just for fun. New features have been revealed for Mario Kart 8 Deluxe. In a press release from Nintendo Poland, five new battle modes and Inkling amiibo support were confirmed for the game. The five new battle modes are the classic Balloon Battle and Coin Rush modes, the returning Bob-omb Blast and Shine Thief modes, and a mysterious Piranha Plant mode. This is a hefty amount of variety, but it may not be worth the full price of admission for those who already own the Wii U version. It’s surprising to see no new courses added this “Deluxe” version, but it’s likely that they’re saving them for DLC down the line. On the Amazon UK website, the Piggy Back brand strategy guide for Breath of the Wild has revealed some juicy details. The page has since been taken down. The number of shrines (which are basically mini dungeons), sidequests, and some sort korok seed puzzles have been revealed. There will be 120 shrines, 76 sidequests, and 900 korok seed puzzles. That is a lot of content, not even including the seed puzzles, which we have no information on. These shrines seem to be pretty lengthy from what we’ve seen, so we could be looking at 60 plus hours of gameplay from those alone. Who knows how long the sidequests will be, but I’m sure they won’t disappoint. Breath of the Wild is seemingly humongous, which is exciting, but it’s even more awesome that we’ll be able to play it anywhere using the Switch. Much like the physical games themselves, the digital titles will be tied to whatever account is active on the Switch. Reportedly, the Switch will allow up to eight different accounts to be active at once, meaning the owner can be linked to eight different countries. This is yet another huge deviation for Nintendo, whose past two consoles were wholly and completely region locked. It will be interesting to see the result of this decision. As another week slowly passes before the Switch’s launch, I continue fighting the urge to cryogenically freeze myself in anticipation. Here’s hoping I make it through the next five weeks.